Even though my father suffered from Alzheimer’s for nearly 10 years, it’s still a surprise when I’m told that dad has died. I always hoped that my dad’s heart would soften towards faith matters and that he might have a “Letters to a Skeptic” experience re Greg Boyd seeing his elderly father accept Christ late in life. But such was not the case. 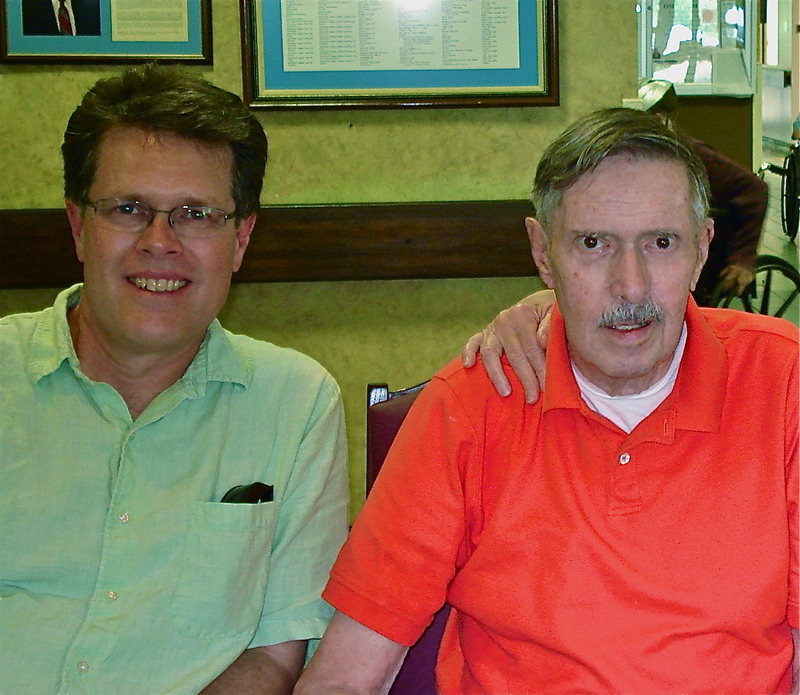 Nevertheless, he was my dad and I loved him. As his mind deteriorated, names and memories faded and for the last three years or so, dad didn’t remember much of his own life or recognize immediate family members. But I take comfort now in re-reading a letter I wrote to him last year regarding the impact that he had on my life, and for better or worse, being part of the fabric for the man that I have become. This has been a cold winter in Minnesota. It’s hard to believe that we’ve lived here for nearly 26 years. We had a fun time over Christmas although only Hannah was able to be with Nancy and I. Brian and his wife spent Christmas with her family in Oregon. And Becky, who is now a registered nurse, married and living in Louisville KY had to work – such is the life of a first year nurse. I hope all is well with you. Mom has told me that some of the problems you’ve had with your feet and shoulders are getting better and that now you’re working on your balance to start walking with more confidence. It brings about respect for one’s self and also the respect of other people. You were umpiring a little league baseball game in La Grange and called me out on strikes. At the time I was crushed. It wasn’t until much later that I realized that you played fair with me and that you played fair with everybody else. You called it as you saw it. I recall the “little incident” regarding the coin-collection books when we were living in La Grange. I’d stumbled onto the “mother-load” and couldn’t believe the “good fortune” that allowed me to buy all the candy I wanted. You taught me through that incident that stealing is obviously wrong. I suppose I already knew this. However – and even more importantly, lying about it was even worse. That’s pretty self-evident and sometimes it might be hard to swallow a little pride. But who we are is reflected in what we do and how we act towards others and when we have offended or wronged someone, apologize. You and Mom made me pay back the face value of coin-collection money I’d stolen through house-hold chores. And there was no TV until I’d paid back the full amount!!!! It was 9 months before I could to watch TV again. I don’t recall you ever requiring perfection – whether grades at school, doing homework, washing dishes after dinner, mowing the grass, or even picking up rocks in the backyard by the pond in Indiana before the grass was seeded. I’m sure you, as I did with my kids, understood that there was a certain ability (or lack thereof) to do a task. However, the effort put into the task was more important than how successful was the end result of that task. Just do your best, give it your best shot, and let the details take care of themselves. You didn’t like it when any of us kids whined. From my own raising of children, I certainly understand. Something I picked up along the way was getting a task over and done with quickly beats long term complaining anytime. Learn from other people’s mistakes. There’s no need to reinvent the wheel. After only one year of college, I enlisted in the Coast Guard without your knowledge. I know Mom wasn’t too keen on this and inquired about getting me out of my enlistment. You argued against Mom interceding. I had to follow through. The decision was made and it was pointless to look back. Don’t be cheap. Enjoy the fruits of your labor. When you had the time, tools, and talent, you built stuff. I remember various things you did in that regard – painting the house in La Grange, cutting steel table frames to height with a hacksaw, adding the veranda on the back of the house, installing the privacy fence around the pool in Tucson, etc. Actually, it was Mom who taught the lesson. You were definitely the pupil – albeit perhaps not a very good one right then. So, if nothing else, I learned that even if I don’t think something has value, someone else might and therefore I need to be sensitive to their feelings on the matter. Thanks for being my dad. Thanks for teaching me all that you did about being a man, honor, commitment, follow-through, and doing my best. I would hope that in some small way you’d be able to look at me and realize that I turned out okay and to know that much of who I am is directly attributable to you. A Calvinist Spanking of Yours Truly from Christian Clarity Review? Believing God’s Sovereignty in Sickness – and in Health, too?